But those are different positions than the ones Flynn staked out in an op-ed he published on Nov. 8, Election Day. In that piece, Flynn, who was named Donald Trump’s national security adviser last week, denounced the coup attempt. He also said that Obama was not doing enough to help Erdogan and Turkey. So what caused Flynn to change his position on Turkey in those intervening months? “This is Turkey under Erdogan, who is actually very close to President Obama,” said Flynn, who served as director of the Defense Intelligence Agency in the Obama administration. “If the military succeeds, one of the things that the military immediately said is, ‘We recognize our responsibilities with NATO, we recognize our responsibilities with the United Nations, we want to make sure that the world knows, we are, we want to be seen as a secular nation,'” continued Flynn, who appeared to believe at the time that secular members of Turkey’s army were carrying out the coup. “That is worth clapping for,” he added. Flynn also said that he had been in touch with a Turkish military counterpart who gave him information about the coup attempt, which was unsuccessful but left nearly 300 soldiers and civilians dead. But Flynn came out against the coup in his Nov. 8 op-ed, published at The Hill. He has also embraced the Turkish government’s allegations that Fethullah Gulen, a U.S.-based Muslim cleric who is an enemy of Erdogan’s, was behind the putsch. “But the Obama administration is keeping Erdoğan’s government at arm’s length — an unwise policy that threatens our long-standing alliance,” he wrote, undercutting his comments on July 15 that Erdogan and Obama were close allies. “We need to adjust our foreign policy to recognize Turkey as a priority. We need to see the world from Turkey’s perspective,” he added. Flynn alleged that Gulen, who lives in exile in Pennsylvania, is not a moderate Muslim, as the cleric and his followers claim. He also asserted that Gulen is Turkey’s version of Osama bin Laden and that the imam’s teachings mirror those of the founders of the Muslim Brotherhood. Flynn did not mention that Erdogan and his Justice and Development Party (AKP) are also considered allies of the Muslim Brotherhood. The drastic change has raised questions about Flynn’s financial connections as well as his judgement, especially since he will have Trump’s ear on all national security issues at the White House. Two months after the speech, Flynn’s consulting firm, the Flynn Intel Group, was hired to lobby Congress by a small Dutch firm owned by a Turkish-Dutch businessman who has connections to the Turkish government. The businessman, Ekim Alptekin, has told The Daily Caller and other outlets that he was not aware of Flynn’s op-ed prior to its publication. He also says that he hired Flynn’s firm on behalf of a non-Turkish energy company rather than for the Turkish government. One explanation that has been floated for Flynn’s flip-flop is that during his July 15 speech he was unaware of allegations that pro-Gulen military leaders, and not secular military officers, directed the overthrow. But even if, as evidence now suggests, the coup attempt was carried out by Gulen sympathizers and not by secular leaders, Flynn’s remarks during the July 15 speech would not sit well with Erdogan. In the speech, Flynn praised Abdel Fattah el-Sisi, the Egyptian general who in 2014 overthrew Egypt’s democratically-elected Muslim Brotherhood president Mohamed Morsi. “He took his religion on. He took this ideology on. And what did we do? We pushed him away,” Flynn said of el-Sisi. 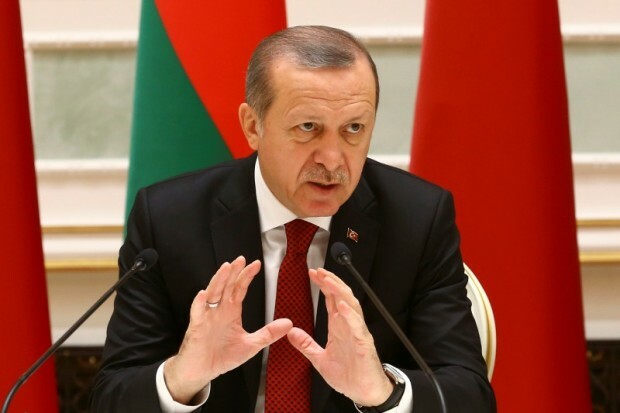 Erdogan, who was an ally of Morsi’s, denounced el-Sisi after the coup attempt in Turkey. “Sisi is a putschist just the same as the coup plotters in Turkey because he led the military coup against Mohamed Morsi – the president elected by the people – while he was Morsi’s minister of defense,” Erdogan told Al Jazeera in July. A U.S.-based businessman with experience in both Egypt and Turkey said that Flynn’s praise for el-Sisi conflicts with his new support for Erdogan. “Erdogan has been tireless in his outrage against el-Sisi and his military coup,” the businessman, who asked not to be named, told TheDC. Flynn has not commented directly on his changing positions on the coup attempt and Erdogan. He announced last week that he was cutting ties with Flynn Intel Group. Alptekin told TheDC that the lobbying contract between his firm and Flynn’s has expired and will likely not be renewed. Alptekin’s denial that he was behind Flynn’s op-ed leaves open the question of what sparked the retired Army general to write the piece. Flynn has had discussions with Turkish activists in recent months about the Gulen issue. In October, Flynn met in New York City with Halil Mutlu, a cousin to Erdogan and the former head of the Turken Foundation, a U.S.-based non-profit with links to the Erdogan family. During that meeting, Flynn also discussed the Gulen issue with a Turkish-American activist named Ibrahim Kurtulus. Kurtulus stated on his Facebook account at the time that he had a chance to “educate” Flynn on the alleged links between Gulen and the coup attempt.